Oprah Winfrey is sending one lucky winner on a Miami Beach Getaway for two with the Magazine Miami Getaway Sweepstakes and this could be you. 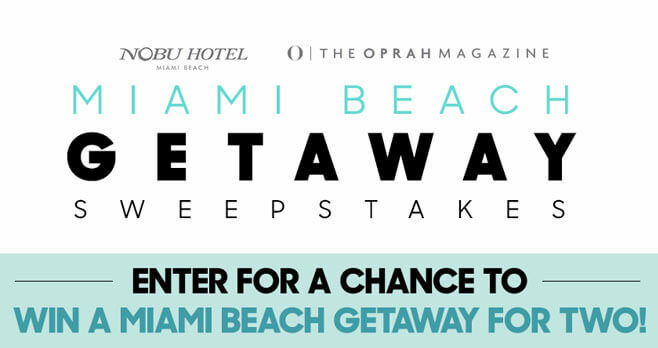 Visit oprah.com/miami now and enter for your chance to win a 3-night stay at Nobu Hotel Miami Beach. The Oprah Magazine Miami Getaway Sweepstakes is open to legal residents of the 50 United States and the District of Columbia, who have reached the age of 21 in their state or territory of residence at time of entry. Legal residents of Canada (excluding Quebec) who have reached the aforementioned age in their province of residence at time of entry are also eligible to enter. The Sweepstakes begins on October 2, 2018, at 12:01 AM (ET) and ends on November 12, 2018, at 11:59 PM (ET). Limit one entry per person for Sweepstakes. The grand prize consists of (i) a three (3)-night stay for Winner and guest to Nobu Hotel Miami Beach (single room, double occupancy, standard accommodations), and (ii) $500 in flight credits towards two roundtrip coach class airfare tickets from anywhere within the US and Canada.. Visit oprah.com/miami to enter and see Official Rules for details. Love your magazine. Would love to win this sweepstakes!. I live I the North and I really love the heat and warmth.